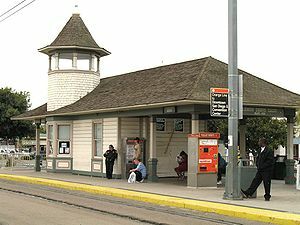 Law enforcement officers conducting a probation compliance operation focused on Lemon Grove trolley stops arrested 12 people many of whom were former state prisoners who were being supervised by local authorities, according to a San Diego sheriff’s sergeant. Deputies from the Rancho San Diego and Lemon Grove sheriffs stations and Metropolitan Transit System officers conducting the trolley sweep on the Main Street and San Altos trolley stations between 2 p.m. and 9 p.m. Tuesday during the “Operation Lemon Drop,” sheriff’s Sgt. Mike Krugh said. More than 500 people were stopped so authorities could determine whether they were in compliance with trolley fares, which resulted in about 90 probation or other searches, Krugh said. Authorities made four felony arrests, eight for misdemeanor offenses, and issued 19 citations during the trolley sweep for trolley-related violations, according to Krugh. “The goal was to identify and contact prolific offenders and their associates,” Krugh said in a statement. Krugh said that many of those arrested “fell into a category of realigned offenders,” or were previously convicted non-violent offenders who were shifted from being supervised by the state into the responsibility of local law enforcement agencies as a way to cut costs and reduce overcrowding at state prisons. The sergeant added that the information gleaned from the sweep will help authorities determine where to devote investigative resources in local neighborhoods. A similar operation at the platform at 3443 Main St., also in Lemon Grove, on Friday netted 53 arrests, sheriff’s officials said.